Hate shopping in a mall? Tel Aviv has some wonderful shopping alternatives. Trendy neighborhoods and districts with street shopping and markets are just some of your options. The Shuk HaCarmel is located between Allenby Street, Kikar Magen David along Carmel Street and King George. Like all the markets in Israel, it is open every day of the week except Saturdays. Shuk HaCarmel is also famous for its clothing stalls. People come from all over the country to spend a day shopping here for clothes and bargains. Designer knock-off shirts, shoes, bags, belts, underwear, you'll find it all. Remember to bargain. Great fresh produce too! 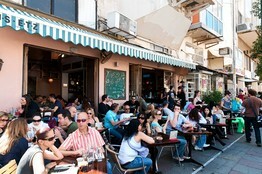 The trendy Shenkin Street is just a few hundred meters walk from Shuk HaCarmel. Tel Aviv is like no other city in Israel - a mostly secular city, anything goes. Great night-life and shopping and the well known Shenkin Street, has to be Israel's trendiest shopping district. It's always buzzing. Designer clothing stores; retro, funky items, record stores, cafes and restaurants, furniture and jewelry, Shenkin is the place to see and be seen - good chance you'll see your favorite TV actor or other celebrity enjoying a cuppa-joe or out shopping. Just a few hundred meters from Shuk HaCarmel and not far from Nachlat Binyamin craft market, Shenkin is not to be missed. A "must-do" with your guests from abroad. The Nahalat Binyamin craft market is open in Tel Aviv in summer, on Tuesdays from 10:00 - 18:00 and on Fridays from 10:00 - 16:00. During the winter it is open on Tuesdays from 10:00 - 17:00 and Fridays from 10:00 - 16:30. The are about 200 vendors selling top quality hand-made, artistic and craft items. Items for sale are made of wood, glass, fabric, plastic, paper, rocks and almost any anything. Coffee shops, street performers and live music are part of the attraction and put Nachlat Binyamin on the top on your itinerary. It is a great place to buy a special and original gift for someone your love. Some stunning architecture, beautiful buildings built in the 1930's in the Bauhaus tradition, can be seen along here as well.